Any Mustang with the Shelby name attached to it is bound to be extraordinary, but some are more special than others. 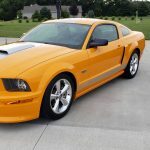 Only sold new in California at authorized Shelby-Ford dealerships, this 2008 Shelby Mustang GT-C is an exceptionally rare breed that packs a 319 hp punch underneath its special sunny-day colors. 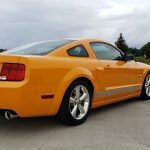 You probably have heard of the 2007-08 Shelby GTs, but the GT-C was more limited in production and meant to stay out west. 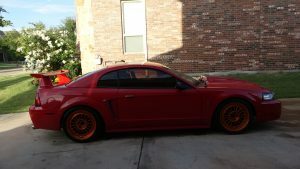 Only about 215 of these were ever made, each one with the exclusive Grabber Orange and silver stripe package. 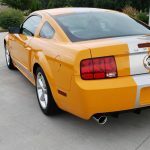 The Shelby GT package added a deeper front air dam, a special billet grille with offset Mustang emblem, a hood scoop, hood pins, and the requisite Shelby emblems and badges. Out back, you get big SHELBY block letters as well as a diffuser panel under the bumper and twin exhaust tips that shine brightly. The interior remains the same fantastic Mustang you’ve grown to know and love, with black leather being the dominant theme. Sculpted buckets are all-day comfortable, the instrument panel is equal parts retro and state-of-the-art, and the packaging job on the airbag steering wheel is nothing short of miraculous. As a Shelby, you do, of course, get a signed, numbered plaque on the dash, as well as a Hurst short throw shifter for the five-speed manual transmission. 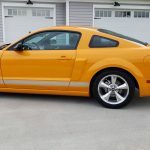 Plus, you get a loaded Mustang equipment list that includes air conditioning, cruise control, power windows, power locks, and power driver’s seat. 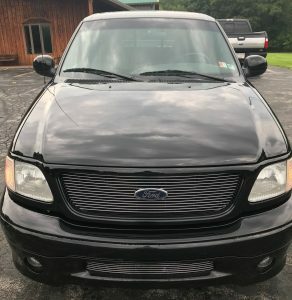 Plus, this one has a sunvisor signed by Carrol Shelby, and the optional Shaker 1000 system with AM/FM/6 disc CD player and subwoofers, and HID headlights! 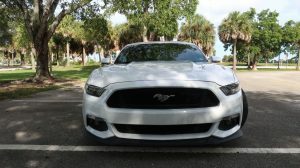 Ford’s 4.6-liter V8 got a few tweaks for duty in the Shelby GT, starting with a cold air induction system and the Ford Racing Power Upgrade Package, which ups output to 319 horsepower and 330 pounds of torque. There’s also a strut tower brace that really makes a statement in the tidy engine bay and provides yet another reminder that this is no garden-variety Mustang. This also has a special engine compartment dress kit with matching covers for the engine and fuse block. Underneath there’s an X-pipe exhaust system that gives the Shelby a distinctive sound, and it’s extremely clean underneath. 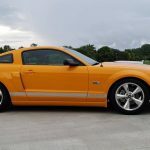 This features Ford’s Racing Handling Pack, which includes specially tuned shocks and struts, lowering springs, oversized sway bars, and a 3.55 limited slip rear end. 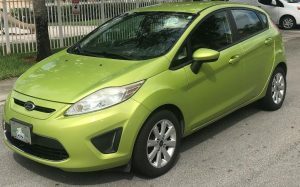 Add in power steering, four-wheel disc brakes, ABS, and sticky BF Goodrich gForce radials on 18-inch premium wheels, and now you’ve got a truly special package that’s a blast to drive. A Shelby is a classic from day one, and that’s why this one has been kept so well with documentation that includes the owner’s manual (still sealed), window stickers (Ford & Shelby), and original components. 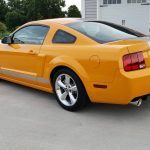 Yes, this car is as special as you think it is, and the fact that most people don’t even know it exists just means this Graber Orange Shelby will be grabbing attention for decades to come. These are a rare sight so reach out today or regret it tomorrow! The Stubby antenna added for better looks and to use with car cover (have original too). Free Delivery Anywhere in the state.